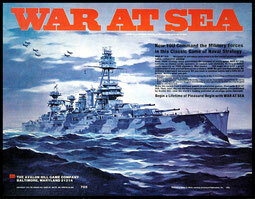 Welcome to the home of the 12th Boardgame Players Association War at Sea play-by-email (PBEM) tournament. The latest news regarding the tournament is shown below. Facing a Barents on 1 strategy, the Axis dodged until turn 3 when they sortied to the Barents only to face disablement by the Allied CVs. A turn 4 U-boat sortie was crippled with 4 U-boats sunk and the Axis were never able to mount a significant threat again and faced a +10 POC lead after turn 7 with a depleted Axis fleet. Axis won the Barents on T2 doing good damage to the allies, but losing 4 ships in the process. U-boats disabled a convoy once, but then let it through later with 3 damage. Axis still had chances but a dismal T7 battle result in the Barents left one convoy to go through to Russia, and the last one doing a rare port in Britain to leave the Allies up by 5 after the bid before T8. T8 desperation moves were then unsuccessful. Don commented that Bismarck must have been made with magnets as 5 of 6 airstrikes struck home (combats, in port to repair). Airstrikes definitely a big factor in Allies win. Not to mention getting both 357s in the first combat on T2. Fun game, could have gone either way based on just a couple of rolls. Jonathan Lockwood (50 points, #1) and Mike Brophy (40 points, #2) earned byes through to the semifinals - Mike having done so after finishing with an identical Swiss record to Tim. Same strength of schedule, same number of wins and Axis wins, same everything...they could only be separated by the final tiebreaker, a roll of the die! So in the semifinals, the matchups were Brophy vs. Bodenheimer (in which Karl bid 2.0 POC to play the Allies) and Lockwood vs. Pacheco (in which Mike bid 3.5 POC to play the Allies, possibly a record in the long history of WAS tournament play). SEMIFINAL #1: Mike Pacheco (Allies) defeated Jonathan Lockwood (Axis, +3.5 POC) after six turns of their semifinal, so the sole remaining undefeated player in the tournament failed to reach the final. An AAR on what sounds like it was an exciting game will be forthcoming presently; commiserations to Jonathan on securing third place in the tournament, but congratulations to Mike on moving to within one game of the title! T1: Allies went for the blockade, Axis sailed to the South Atlantic. Axis won the battle, losing 2 ships to the Allies 3. All German ships oiled except for the disabled Scharnhorst. Axis +3 POC. T2: Allies conceded the Barents, Axis oilers went there. LBA sinks Fiume. Scharnhorst to the Med. Axis +5 POC. T3: Scharnhorst, 3 Italian cruisers and U-boats to the South Atlantic. Both Russians sail and are met by the German fleet. No losses in the South Atlantic, U-boats prevail. Both Russians sunk. Axis +5 POC. T4: Scharnhorst, 3 Italian cruisers return to the Med. 7 U-boats to Barents. German fleet to Baltic. Allied LBA picks off 2 Italian cruisers! 1 U-boats survives ASW and inflicts 1 damage on convoy. Axis LBA sinks Ark Royal, and inflicts another 1 damage on convoy. Twice-damaged 1A makes it to Russia. Axis +2 POC. T5: With Barents open, German fleet sails to the North Atlantic, U-boats to the South Atlantic. A damaged and disabled German fleet puts into France after one round. U-boats keep the South Atlantic open. Damaged Allied fleet loses 1 BB and 1 cruiser. Axis LBA disable convoy 2B. Axis +2 POC. T6: 7 U-boats, 9 Axis ships square off with a similar number of Allied ships in the South Atlantic. One of two convoys enters the North Atlantic. By the time it is all said and done, the Axis carries the South Atlantic, losing half its U-boats and 5 ships. Axis back to +5 POC. T7: Crippled Axis fleet sails to the Med. 5 U-boats sit it port as ASW distribution is healthy in all 4 areas. Convoy 2B gets past the Axis LBA, and POC is reduced to Axis +1. T8: With a bid of 2.0 POC, the Axis can give up the 3 points for the convoy. It will come down to the 6 U-boats breaking an area, and forcing a tie. ASW distribution was 11-11-12-12. U-boats opt to go against 12 ASW in the Barents, where convoy 3C is sailing. Only 1 U-boat survives, and it sinks the convoy on a 6-6 roll (counterbalancing the snake eyes damage on convoy 1A). Final score Axis +1, and Axis 3.0 with the bid. THE FINAL: After a grueling encounter that went all 8 turns, Mike Pacheco emerged victorious by 3.5 POC after the bid. Hopefully a full report will be forthcoming shortly from one or both Mikes...stay tuned! The tournament format consists of five Swiss rounds, from which the top six players will qualify for a three-round elimination stage. (The top two players in the standings will receive byes directly to the semifinals.) For more information about the tournament format and other rules and guidelines, click on the relevant links at the top of the page. AFTER ACTION REPORTS ENCOURAGED: Note that we will endeavor to include any postgame recaps you wish to provide on the website, giving them their own unique webpages and including as many pictures (within reason) and as much text as you want. So please think about this as your games proceed - we'd love to document as much of the tournament action as possible! Contact Darren if you have any issues with or questions about the tournament. The Assistant GMs will help adjudicate any unfinished games and moderate any issues which come up in the GM's games.